Corrosion protection specialist Alucrom AB used a coating system of just two layers from Hempel for an efficient and lasting protection of the gigantic steel towers for wind power plants. The topcoat is based on Pasquick™ technology by Covestro. By that the company contributes to a higher profitability of this renewable energy. Wind power is among the most sustainable technologies for generating electricity and it is achieving tremendous growth rates worldwide. However, to fully exploit the potential of this renewable energy source, wind turbines need to become significantly more cost-efficient to manufacture and operate. One critical factor in this connection is the corrosion protection of the enormous steel components, notes a press release from the company. Swedish corrosion protection specialist Alucrom AB operates a major plant in Malmö for coating wind turbine components: in 2008 alone, steel towers with a surface area exceeding 300,000 square meters were blasted and coated. To satisfy the rising demand, Alucrom was in search of a cost-efficient and time-saving coating solution, and turned to the Danish coatings producer Hempel for help. Hempel mastered the task by developing a coating system of just two layers, comprising a zinc epoxy primer and a topcoat based on Pasquick™ technology from Covestro. The technology and coating system passed all tests and Alucrom had been using them as a standard solution ever since. The company was now in a position to deliver six, gigantic steel towers a week to its customer Enercon Windtower Production AB. With Pasquick™ technology, the number of coats can be reduced compared with the conventional process. The outer layer is thicker; Alucrom worked with a dry layer thickness of 320 micrometers. In addition, the coatings cure faster. Both factors help to further reduce the cycle time and manufacturing cost of wind turbines. The corrosion protection is just as long-lasting and high in quality as with the standard process. This is an important prerequisite for producing turbines with long service lives and minimal maintenance requirements and thus for the cost-effective use of wind energy. The technology has advantages over conventional coatings even in ecological terms: Alucrom observed a significant reduction of some 30 percent in the emission of volatile organic components (VOC). 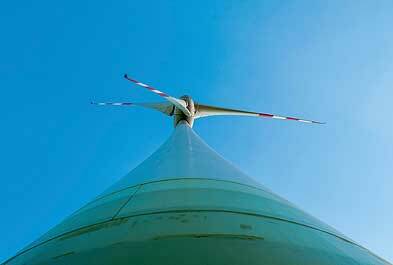 The collaboration between Alucrom and Enercon began in 2008 and ended in 2015, when the wind turbine manufacturer decided to apply the coatings itself. The outstanding results, however, are unchanged: efficient, lasting, low-maintenance corrosion protection for wind turbines.